In this episode I’m joined by my old friend Alex Simmons who just so happens to be the presenter of Rugby AM TV show and owner of one of the UK’s most exciting media production companies. – The lessons Alex has learnt from a career as a DJ, events promoter, and now a media mogul ! – The best athletes in the world and why I think MMA fighters are awesome! – Mental Health and depression for athletes leaving their careers and moving into the real world! Take this assessment based on your views towards your career or business aspirations. What would you say is holding you back from achieving your business or career goals? What is your biggest single challenge in your business currently? How clearly do you understand what your goals are in your career or business currently? How confident are you in your own ability to achieve your business or career goals? Extremely confident, just give me a little more time and everything will happen exactly as I want it to. I’m confident, but I know that I need to keep improving and bringing the right people in to help me along the way. Petrified- I have no idea what I’m doing and therefore don’t do anything! How much time do you have to devote to building your career or business? How confident are you in your ability to influence people around you to do what you want them to do? This might be sales, marketing, leadership or anything else. Not very confident, things don’t usually go my way. How fulfilled are you currently ? Very fulfilled every week I’m improving and challenging myself as well as contributing to something that inspires me. How close are you to earning the money you want to earn? It’s happening now- I’m very happy with my financial position all things considered. How close are you to being in the position you wanted to be in at the age you are? I’m nowhere near, this is much harder than I thought! What percentage of your current client base are the clients you actually enjoy and want to work with? What do you think you need to get to where you want to go? A plan- I am incredibly self motivated but I need some help with strategy and tactics to help me move forwards. Finances- I need someone to invest in me so I can go out there and do it. More time- If I have another day a week I’d be a millionaire in a few years! Don’t know- I need someone to help me see what I need! Thanks for taking your Personal Performance Assessment, Enter your details below to receive your report & to get updates from Strength & Success. Strength & Success, will send you important details & marketing email periodically, You can unsubscribe at anytime using the unsubscribe link at the bottom of any email. We do NOT pass on any details to third-party companies or marketing agencies. Your security of details are as import to us as you. Strength & Success, would love to send you important details & marketing emails periodically, You can unsubscribe at anytime using the unsubscribe link at the bottom of any email. We do NOT pass on any details to third-party companies or marketing agencies. The security of your details are as import to us, as they are for you. Join us on the Elite Coaching Blueprint course and take your career to the next level. Join us on the It Starts With You course and take your career to the next level. The company provides coaching and mentoring services and training, and support to Customers (‘the customer/’you’/’your’). References to “events” or “programmes or ‘courses’ in these Terms and Conditions are references to online and live training, one to one and group Mentor sessions. Please carefully read the following terms and conditions relating to your participation in the Company’s products/events/seminars/courses/workshops. For the sake of these terms and conditions products/events/seminars/courses/workshops will be collectively referred to as ‘Courses’. By registering for or purchasing the course you (the ‘Buyer”) signify your acceptance of and obligation to these terms and conditions. If you have objections to the following Terms and Conditions, you should not register for, or purchase our products, courses or events. You hereby acknowledge and agree that you have read all the terms and conditions and you agree that the Order Form together with these Terms and Conditions form a contract between you and Strength and Success Ltd . These terms and conditions (the “Terms”) and any credit approval application (“Credit Application”) are the basis of the contract (the “Contract”) between (“Strength and Success Ltd ”/”us”/”we”/”our”) and you. We may amend these Terms from time to time. Every time you wish to make a booking with us, please check these Terms to ensure you understand the terms which will apply at that time. Only persons aged 18 year of age or over and who are able to enter into a binding agreement are eligible to become Customers of the Company. Payment of the deposit (as detailed below) is an offer by you to enter into a binding contract with us, which we are free to accept or decline at our absolute discretion. We intend to rely upon these Terms and any document expressly referred to in them in relation to the Contract between you and us. We have the right to revise and amend these Terms from time to time. You will be subject to our Terms (including policies and procedures) in force at the time that you enrol on a course with us, unless any change to those policies or these Terms is required by law or government or regulatory authority in which case the same will apply to courses you have enrolled on or started. If you do not provide us with the requisite information, or you provide us with incomplete, incorrect or inaccurate information or instructions, we may make an additional administration charge of a reasonable sum to cover any extra work that is required or choose to cancel this Contract. Please print your name clearly on the application form. Your name will appear as detailed on the form on your certificate. A fee of £20 will be charged should you wish to amend and re-print your certificate. Applications will only be accepted with payment of the deposit, although please note that some courses require payment of the full fee. Please note that any deposits are non-refundable. If your course requires you to have a particular qualification, you must provide proof of that qualification when enrolling. The balance of course fees (i.e. the total fee(s) less any deposit previously paid) is due no later than 28 days before the course attendance starts. If the balance is not paid by this date, we reserve the right to suspend access to online accounts and/or treat the course as being cancelled and offer the place to another student. All course bookings are subject to availability. If you are unavailable when course materials are delivered to the address provided by you and they are not collected from the local depot an additional distribution fee may be charged if we are required to take receipt of, collect and/ or redeliver the materials. Our stated course fees include any delivery charges we incur to send course materials to a UK mainland address other than as stated in these Terms. Please note if your course materials have to be delivered to a non UK address, you accept liability for the delivery charge we will incur. Please contact our Customer Service Team on 0113 237 9653 or info@strengthandsuccess.co.uk to check the delivery charge for the said course materials. Bookings made via third parties – Strength and Success Ltd work with a number of third party resellers for various courses. If customers have engaged with and enrolled via a third party all details of the enrolment process will be held with that third party, all queries relating to the enrolment process should be directed to the third party in question. Strength and Success Ltd are only responsible for the delivery of the product purchased. By law we can only guarantee your satisfaction with our training, not your results. Our courses and programmes are for your educational and informational purposes only. As stipulated by law, we make no guarantees that you will do well, achieve any results or make any money from our information, and we offer no professional, legal, therapeutic, or financial advice. Our training cannot replace or substitute for the services of certified professionals in any field, including, but not to, financial, health, or legal matters. We do not purport anything we do or teach as a “get rich scheme,” and any financial numbers outlined in our training are examples, opinions and illustrations, and thus should not be considered average earnings, exact earnings, or promises for your actual or future performance. There can be no assurance that any prior successes, or past results, as to income earnings, can be used as an indication of your or anyone’s future success or results. Check with your accountant, lawyer or professional advisor, before acting on this or any information. You alone are responsible and accountable for your decisions, actions and results in life, and by registering for our courses, workshops, events, you agree not to attempt to hold us liable for any such decisions, actions or results, at any time, under any circumstance. You agree that our Strength and Success Ltd is not responsible for the success or failure of your business or personal decisions relating to any information presented by our Strength and Success Ltd, or our Strength and Success Ltd products or services, and you specifically release our founder, Brendan Chaplin, or our representatives or contractors from liability for any special or consequential damages that result from the use of, or the inability to use, the information or strategies communicated through our Seminars, Courses, product materials, websites, or any services provided prior to or following this program, even if advised of the possibility of such damages or caused by negligence of the company or its representatives. You, the buyer hereby accept all risk to his or her business and health excluding personal injury or death that may result from the companies’ negligence whilst the buyer has been participating in the courses. Any other loss or damage of any kind suffered as a result of or incurred arising out of or in connection with the provision of the Services in terms of this Agreement even if such losses are foreseeable or result from a breach by the Strength and Success Ltd or as a result of any action we have taken in response to any breach by the Customer. The company requires all buyers to be respectful and professional to our staff, location hosts, coaches, and other customers and their guests or families throughout the course of any programme. The company reserves the right to ask the buyer and /or their guests to leave the venue immediately should they be deemed rude, uncooperative, unprofessional, intoxicated or in possession of alcohol or any illegal substance. In such case, the Buyer’s tuition/fees for the Level 4 will not be reimbursed under any circumstances and they will not receive any of our advertised bonuses or qualify for our satisfaction guarantee or any other written or implied guarantee. Where payments are made by agreed instalments and those instalments have not been paid on the due date, we reserve the right to withhold the release of examination results and/or delay the marking of course work until outstanding sums are paid. We reserve the right to suspend access to online accounts and/or treat the course as being cancelled and offer the place to another student. No refund of any course fees paid by you will be made. We also reserve the right to charge interest on late payments at a rate of 4% above the base rate from time to time of Lloyds Bank (or other UK clearing bank) as may be notified to you accruing on a daily basis until payment is made. If you are a business, we additionally reserve the right to claim interest under the Late Payment of Commercial Debts (Interest) Act 1998. If you are a consumer and make a booking via our website or by telephone, you have a legal right to cancel a Contract under the Consumer Contracts (Information, Cancellation & Additional Charges) Regulations 2013 (‘Distance Selling Regulations’) during the cooling off period of 14 days from date of purchase. This means that during the relevant period if you change your mind or for any other reason you decide you do not want to enrol on a course, you can notify us of your decision to cancel the Contract and receive a refund. Advice about your legal right to cancel the Contract under these regulations is available from your local Citizens’ Advice Bureau or Trading Standards office. A cancellation form is available on request. If you exercise your legal right to cancel under the Distance Selling Regulations, you will receive a full refund of the price you paid when booking and we will process the refund due to you as soon as possible and, in any case, within 30 calendar days of the day on which you gave us notice of cancellation. Your legal right to cancel a Contract starts from the date when a booking is made – which is when the Contract between us is formed. You have a period of 14 (fourteen) calendar days in which you may cancel the booking, starting from the day after the day when the booking is made. If this period ends on public holiday then the period will be extended until the next working day. If your course has started but is due to end after the cancellation period then your legal right to cancel still applies. However, you will have to pay a proportion of the course fee which we will base on the total price of the course and the period of the course from the start date to the date of cancellation. for any other course that includes an attendance day(s) – no later than 28 days before the start of the original course. Any alterations and/or cancellations are at our discretion and are subject to an administration fee, as outlined below. where you wish to cancel your course booking but do not wish to enrol on an alternative course, where approved, we will refund you the balance of the fees paid, less the deposit. In any case, no refund will be given for changes or cancellations made with less than 28 days’ notice and under no circumstances will the deposit be refunded. Failure to attend or cancellation of an exam (all courses) will be liable to an administration fee of £100.00. Changes to workshop attendances will be liable to administration fee, details will be confirmed to you when requesting the change. Please call Customer Services to discuss further. In cases where a refund of fees is due, this will be returned to you (at our election) either by cheque or a direct refund on to the credit/debit card used as the original method of payment. The administration fee will be deducted from the amount refunded. We will process the refund due to you as soon as possible and, in any case, within 30 calendar days of the day on which you gave us notice of cancellation. If you wish to transfer courses more than once, we reserve the right to charge an administration fee in respect of each individual transfer and/or alteration. We reserve the right to make additional charges on cancellation to cover costs incurred by us in respect of course materials, online learning registrations and/or tutor time. You will be notified of any charges that may be applicable on cancellation. If circumstances arise that are beyond our control, it may be necessary from time to time to change/cancel course dates, content, venues and prices from those published. Whilst we will make every effort to transfer your booking to the next available course at your preferred venue, it should be noted that we will not be held liable for any costs/losses incurred as a result of any such changes. If we are no longer able to provide your course, we will ask you to return any course materials to us in the condition as originally delivered to you and refund to you any fees paid to date when we receive the materials as required. We reserve the right to remove from any course, students that fail to comply with its standard practices and procedures. We reserve the right to refuse enrolments and/or suggest alternative arrangements if we believe that it will not be in our best interests of other participants and/or the individual concerned to attend one of our courses. Where stated prices quoted are inclusive of VAT. Note that events are not residential and do not include for accommodation or food and beverages unless stated. These are generally “pay in full” prior to the event or payment over an agreed instalment plan/ external 3rdparty finance agreement. Finance is provided through the Pay4Later platform by a number of lenders. You will be informed who the lender is at the point the loan is offered, and provided with their full contact details. If payment is not made within the time limits set out above, this will be a breach of contract by the client entitling Strength and Success Ltd to treat the contract as at an end, and reallocate the bookings and/or tickets without notice to the client. In the event of Strength and Success Ltd treating the contracts as at an end Strength and Success Ltd shall be entitled to retain all sums already paid by the client, and the full balance, if any, of the price of the booking shall become immediately payable by the client to Strength and Success Ltd. This is without prejudice to Strength and Success Ltd rights to claim damages from the client in respect of any loss suffered by Strength and Success Ltd. Cancellation: Any notice of cancellation by the client of a booking or part of a booking must be made in writing by letter or email sent to Strength and Success Ltd. All bookings are subject to a 14 day cancellation period from the date of booking. Refunds will be made within 30 days of receipt of a correct cancellation notice. The exception to this is if you have begun the Level 4 course or any other course/product in which case you will not be entitled to a refund or cooling off period of any kind. Once the Buyer registers for the event or purchases the product or programme, Strength and Success Ltd makes extensive arrangements and investments while anticipating their tuition and attendance, and, in the case of their cancellation, incurs significant administration hassles, expenses, and loss of business. Given this fact we do not accept cancellations or issue refunds beginning 14 days after Buyer has registered for the event or purchased the Programme whatsoever. All advertised packages are subject to availability. Every reasonable effort will be made to adhere to the advertised packages but any packages may be altered or dates changed either before or after confirmation of the booking. Where such alterations, omissions or changes of date occur prior to the confirmation of the booking, Strength and Success Ltd Ltd accepts no contractual liability. Where such alterations or changes of dates occur after confirmation of the booking, Strength and Success Ltd agrees to use endeavours as it considers to be reasonable to make alternative packages available. When lunch is provided at events and Strength and Success Ltd take no responsibility for special dietary or allergic requirements if we have not been notified in advance in writing of these. (b) If we have agreed that you may pay by Instalment, you must pay each Instalment without deduction on the Instalment Payment Date required by us and as communicated. Payments made under this agreement must be made by the means specified. If you fail to pay an Instalment sum by the Instalment Payment Date for that sum then ALL monies owing by you (which includes the full customer-ship and additional company fee) shall become due and owing and must be immediately paid to us without set off or deduction or counterclaim and without need for any further demand. If Payments are not made by the due dates, your course/programme/event may be cancelled and no refund or credit will be given. This agreement shall be voided if you advise us in writing, within fourteen (14) working days of signing the Order Form, that you no longer wish to receive Strength and Success Ltd Services and/or products by delivering or sending (including by electronic mail) a cancellation notice to Strength and Success Ltd . In those circumstances only Strength and Success Ltd will refund to you all monies or part thereof, which you have paid to us under this agreement within thirty (30) business days of receipt of such cancellation notice. The exception to this is if you have begun the level 4 programme or any other programme/product in which case you will not be entitled to a refund or cooling off period of any kind. You further acknowledge and agree that outside of the fourteen (14) working days cooling off period; if, at any time or for whatever reason, you decide you do not wish to receive the products and/or services from Strength and Success Ltd, you will not be eligible for a refund of any monies you have paid to us under this agreement and the balance of the fees set out in the Order Form will become due immediately and payable by you. The fee payable is set out for you at time of purchase either on an online order form, credit agreement, or through our telephone sales process. All Customers are deemed to have agreed to our terms on registration unless otherwise advised within the 14 day cool off period. This is not a credit agreement and as such is not covered by the Consumer Credit Act 1974. The ‘Fee’ is the total amount payable by the Customer over the selected period for the selected service. Should you choose to pay your customer-ship in 1 annual payment on the date of joining, a discount may be applied. (UK ONLY) Strength and Success Ltd reserves the right to move any meeting to another venue within a 50 mile radius of the originally named venue on giving not less than 48 hours’ notice to the Customer. (UK ONLY) All costs of travel to and from meetings and the costs of refreshments, meals and accommodation are excluded from the fees and are payable in full by the Customer. Your cancellation notice must contain your full name, address and contact numbers. See section on cancellations for further information on the 14 day cool off period. (UK ONLY) Should an event be cancelled or withdrawn due to circumstances beyond the Company’s control, the customer will be informed thereof with 24 hours’ notice. A cancelled meeting will be rescheduled at the earliest opportunity and the customer will be given 72 hours’ notice of the details of the new meeting event. No refund of fees or reduction of fees will be due to the customer where a meeting had to be rescheduled. The company shall hold your personal details on file and on computer in accordance with the Data Protection Act 1998. You may view your individual file at the registered address of the Company, stated above, by giving not less than seven days written notice. All material provided to you by Strength and Success Ltd is owned by the Company; Strength and Success Ltd and is protected by copyright. You may not reproduce, modify, copy or distribute or use for commercial purposes any of the materials or content provided by the Company, except with the consent in writing of Strength and Success Ltd. Any other use of the material and content is strictly prohibited. The Customer agrees not to (and agrees not to assist or facilitate any third party to) copy, reproduce, transmit, publish, display, distribute, commercially exploit or create derivative works from such material and content. The Customer agrees to use all information contained and presented in the meetings of Customers only for the purposes of self-improvement. For those customers eligible for personal group or private mentoring or coaching please note that if you do not attend an agreed session with your coach “without reasonable explanation” that session will be forfeited by you and will not be replaced. If any provision of this Agreement is held by any competent authority to be invalid or unenforceable in whole or in part, the validity of the other provisions in this Agreement and the remainder of the provision in question will not be affected and shall remain of full force and effect. Should Strength and Success Ltd at any time fail to insist upon strict performance of any of your obligations under this Agreement, or fail to exercise any of the rights or remedies to which the Strength and Success Ltd is entitled under this Agreement, it shall not constitute a waiver of such rights or remedies and shall not relieve you from compliance with your obligations. No waiver by the Strength and Success Ltd shall be effective unless it is expressly stated to be a waiver and is in writing. These terms and conditions will be governed by the laws of England and Wales and you irrevocably agree to submit to the exclusive jurisdiction of the courts of England and Wales. You acknowledge that you have not relied upon or been induced to enter into this Agreement by any representation other than a representation expressly set out in this Agreement and the Strength and Success Ltd shall not be liable to you in contract or tort, under the Misrepresentation Act 1967 or in any other way for any representation not expressly set out in this Agreement. Provided that nothing in this Agreement shall affect the Company, Strength and Success Ltd liability in respect of any fraudulent misrepresentation. This Agreement together with the Schedules sets out the entire understanding between you and the Company in relation to the matters concerning Customer-ship of the Company and no other agreements or understandings, not contained herein, shall be relied upon by you. Strength and Success Ltd reserves the right to make changes to these terms and conditions, which regulate the basis upon Customer-ship of the Company, as may be required. Should Strength and Success Ltd make any such changes it will advise you and you will have the right to terminate your customer-ship of the Company within fourteen (14) days from date of the notice of change, should you not wish to accept the changes. In this event you will not be liable for further customer-ship fees, which fall due after the effective date of a correct notice of cancellation has been received by the Company. Should you have a problem or complaint we want to know. Most problems can be dealt with by sending a letter or email to the address for notices given above. Strength and Success Ltd will endeavour to investigate all complaints and respond as quickly as possible. Strength and Success Ltd will acknowledge receipt and confirm the timescales for a full response when a complaint is received. If any dispute arises between the Strength and Success Ltd and you then we agree to attempt to settle it by mediation. We both remain entitled to seek resolution of any contractual dispute in any court or tribunal without having to undergo a mediation process. If Strength and Success Ltd is prevented or impeded from performing any of its obligations as a result of an event over which the Company has no control (‘Force Majeure’) it shall promptly give notice to you stating the circumstances consisting of such event of Force Majeure and the extent and likely duration whereupon such obligations shall be suspended for as long as the event of Force Majeure continues. If the company is affected by an event of Force Majeure shall make every reasonable effort to minimise the effects thereof and shall promptly resume performance as soon as reasonably possible after removal of the event of Force Majeure. Where the period of non-performance in relation to any event of Force Majeure exceeds 30 Days from the date of notice of such event of Force Majeure then you or Strength and Success Ltd may by written notice terminate this Agreement forthwith. What content are you looking for from the Incubator programme? Please be as specific as you can. These programmes will launch early 2019 and are for business owners with a turnover in excess of £100k. Register your details to be notified when the groups open. The Incubator programme is here, register your interest now. Subscriptions are made on a monthly or annual payment, using our secure paypal checkout. you can manage your subscription by contacting our support team, who are happy to assist with all enquiries. 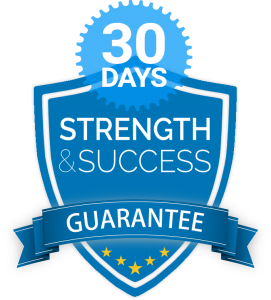 Strength and Success offer a 30 day money back guarantee. We will send you all the details of your new Strength & Success account, after your subscription signup. Please keep these details safe. As a Strength & Success Member you have access to the Fully Booked Incubator Content, whilst you are a subscriber. You will be able to access exclusive time-sensitive content published during your subscription term. Our support team is on hand if you have and questions or account issues. We are here to support you. We will send you all the details of your new Strength & Success account, after your purchase & registration. Please keep these details safe. As a Strength & Success Single Purchase Member you will have access to your Purchased Content Only. Begin the application process now. I need your expertise to guide me Have tried on my own and not had success Confidence Accountability- I need someone to kick me up the arse! Of course, whatever it takes Yes, provided it fits with my current schedule Not sure. Our programmes are designed for people who are looking to take action and really create something life changing that they are truly proud of. The minimum investment is £1500 (payment plans can be explored). Please do not hit submit unless you are willing to make an investment of this level should everything be the right fit.